A black and white negative of the lawn at 600 King Street in Whitby, Ontario. In this view there is a sun dial in the centre of the photograph. 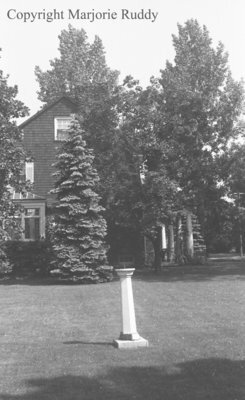 The side of the house surrounded by trees is visible in the background. Gardens at 600 King Street, July 5, 1939, Marjorie Ruddy. Whitby Archives A2013_040_804C.